This recipe is… different. It looks like regular ol’ banana bread, but there is a secret in there. 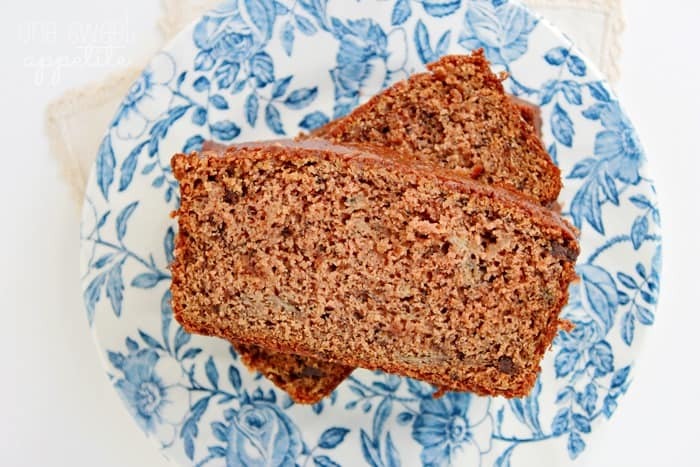 It’s not only filled with mini chocolate chips, super moist thanks to the SEVEN bananas and sour cream, and unbelievably delicious… but mixed into the batter is a tiny amount of cocoa powder that gives this bread an out-of-this-world flavor! If you know me, you know I am NOT a chocolate lover. That’s right people… I hate chocolate. Maybe not hate… but it is never my go-to sweet treat. I’d much rather have something citrus based or fruity. 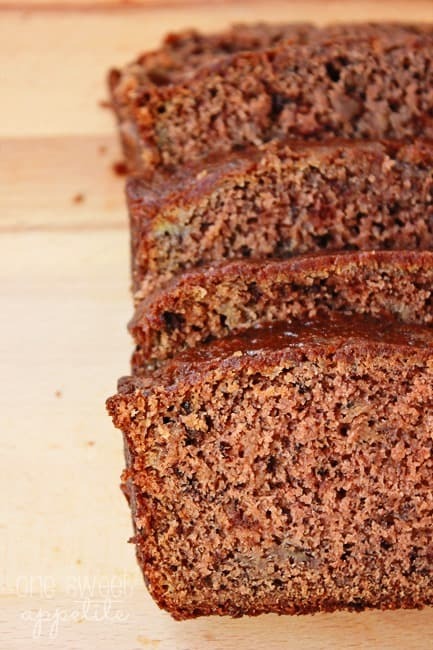 So it is really saying something when I tell you that this chocolate banana bread is to die for. The secret to a great sweet bread is hand mixing. I thought this was just a myth, but trust me. I’ve tried this recipe several different ways, and it’s true. If you use the mixer the entire time your bread will come out dry and dense. Hand mix and you will end up with a moist piece of goodness. Next time I think I might add a little cinnamon. I love a little spice to my bread. What are some of your favorite sweet breads? Preheat your oven to 350 degrees. Spray two bread pans with cooking spray and set aside. Whisk together the flour, baking soda, and cocoa powder. Set it aside. 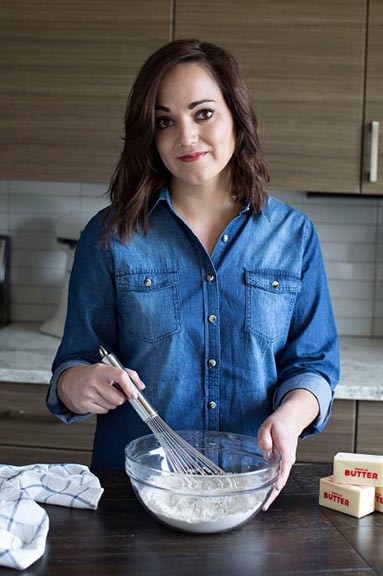 In the bowl of an electric mixer combine the butter and sugar. Whisk until light and fluffy. Add the eggs one at a time followed by the bananas. Mix until combined. Using a wooden spoon, stir in the vanilla and dry ingredients. Fold in the sour cream and chocolate chips. Divide between your two pans. Bake for 60 minutes, or until a knife comes out clean. *If your bread starts to turn brown quickly, cover with a piece of foil. That looks great! I love chocolate and I love banana bread. The best of both worlds. Oh my word! This recipe looks incredible! 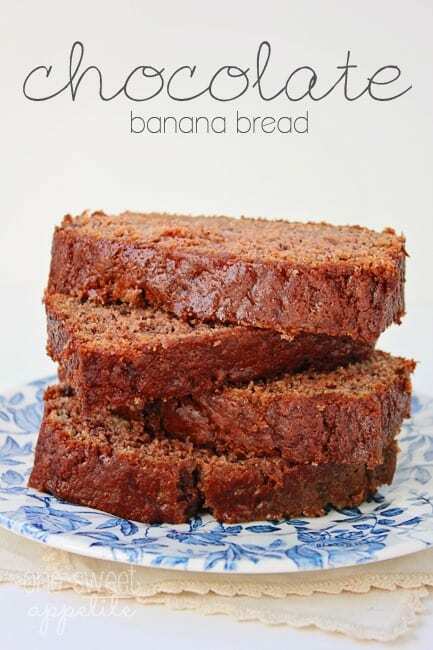 I have never thought of adding chocolate to banana bread. No, seriously. I bet my girls would love this! Yum!! Sounds amazing! Thanks for sharing your recipe, can’t wait to try it out! You don’t love chocolate?! I have never met another girl who doesn’t love it! People always think I am crazy! If you say this is delicious, I am going to have to try it! oh yum that sounds so yummy and I just have to say you and debra are crazy pff who doesn’t like chocolate! ?